Gerda Steiner Designs, LLC: Guest Designer: Safari Race card: how many animals fit in a land cruiser? Fabulous fun! I am curious about what sentiment you chose to put inside such a wow card. This HAS TO BE one of the most adorable cards I've ever seen! Just perfect in every way! As usual you WOW me. How long does it take to color a card like this? I love, love LOVE THIS CARD! Super adorable! What a cute and fun card!!! Love all the great coloring and layering going on. Fantastic job as always!!! Oh my goodness! That is absolutely the cutest card! Love it! Love this and the video! So creative and fun. No surprise it's a Sandy Allnock masterpiece! Just Wow! So cute ad so much fun! So cute. I don't use Copics, but I do love watching you color. Everything, no matter the medium, is super! These two stamp sets are the cutest animals ever! 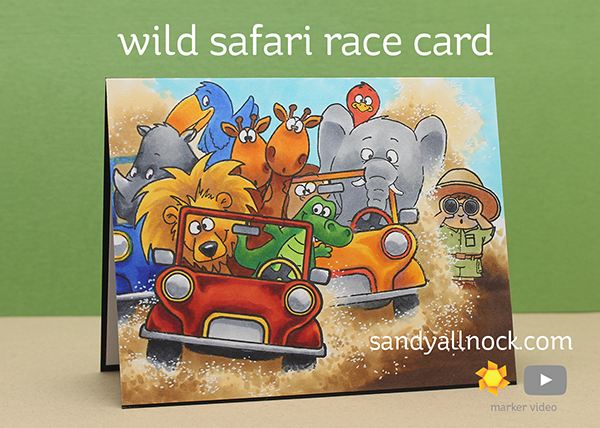 You made them even more fun with your race through the safari! Thanks for the smiles! Really cute and funny card! This card is so adorable. Love it. What a fun card! 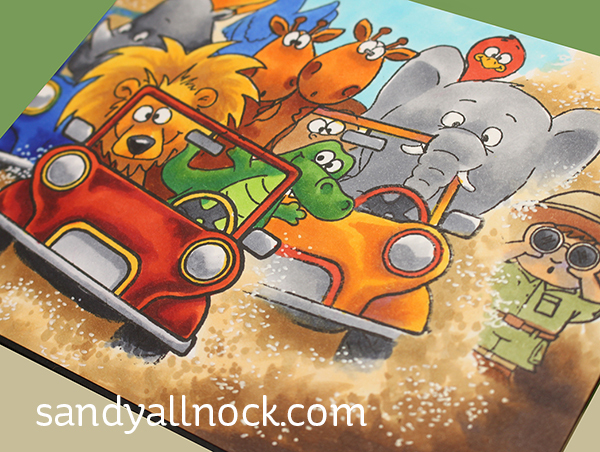 The dust is spectacular and the animals are stinkin' cute, oh yes and the tourist is fabulous. Outdid yourself with this gem. Wowzers! This is the best! Another beautiful coloring job. I could watch you color for hours, however, I don't get much done then. Sandy - you are AMAZING! this card is so fun .... AWESOME!!! I smiled the whole time I watched this video!! What a hoot!! so cute! Can't wait to try my own with this set. Your instructions are so well done...and funny, too. Thank you for all the work you do to bring us these videos. An absolutely fun and adorable card! What's not to love! Love,love,love it!!!! Truly a fun, colorful and totally awesome card!!! Sandy, you are amazing!!! What a fun card! And really great to watch developing! Very well done. You used a lot of color, and it really works. A very interesting, busy, and fun card! wow!1 Must have the sets. Great colours. All of your cards are wonderful, but this one is especially creative and fun!! I'm amazed with your ability to pull various images together and create a scene. Thank you so much for your videos!! Everyday since this post I take a look at the card, and everyday it makes me smile, Thank You So Much for making me smile! This is such a fun card. It makes me think of those car race movies from back in the day with all the celebrities in them. Your coloring is amazing! This is such a fanatically fun card!!! I just love it!!!! As my dead blogger profile is unchangable and unremovable and years out of date. What a great card!!!! Your work is just beautiful. This is one of the most AMAZING cards I have ever seen! Masking must have taken HOURS! And the dirt details---OMG! The result is truly FANTASTIC! I keep watching the video and I want to make this card like you did. What did you say on the inside? Who cares! You are a copic GENIUS! Adorable! What a great and FUN card! Amazing Masking skills!